Mets pitcher Matt Harvey is Sunday's Player of the Day, while Indians pitcher Justin Masterson regained the lead among players in Box-Toppers points. Also Sunday, seven of the day's 15 Players of the Game are among the top 15 players in Box-Toppers points for the season. Harvey pitched seven scoreless innings and struck out 10 in the 5-0 win over the Phillies. Harvey earns 2.0 Box-Toppers points for being Player of the Day, giving him 13.0 for the season, putting him in sixth place overall among players (see the updated top 10 player list for the season on the home page). Masterson is Sunday's American League Player of the Day. Masterson, who had a no-hitter into the seventh inning, gave up only one hit and one run while striking out eight in the 7-1 win over the Twins. 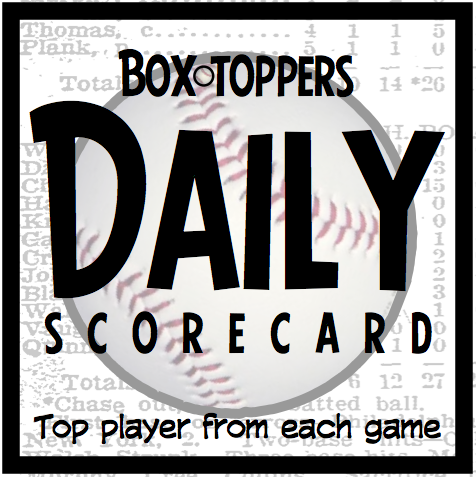 Masterson earns 1.7 Box-Toppers points for being AL Player of the Day, giving him 15.4 for the season, retaking the season Box-Toppers points lead from pitcher Patrick Corbin of the Diamondbacks (14.4 points). (See the updated top 10 player list). Mike Napoli of the Red Sox is AL Batter of the Day. Napoli homered twice, including hitting the walk-off home run in the 11th inning, to beat the Yankees 8-7. Carlos Gonzalez of the Rockies is National League Batter of the Day. Gonzalez went 2-for-3 in the 4-1 win over the Cubs. Gonzalez earns 1.5 Box-Toppers points for being NL Batter of the Day, giving him 11.0 for the season, moving him up to 11th place among all players. Dodgers pitcher Clayton Kershaw was a Player of the Game (7IP 2H 9K in the 9-2 win vs. the Nationals) and earned 1.0 Box-Toppers point, giving him 13.7 for the season. He is in third place among players (see the updated top 10 list). Cardinals pitcher Adam Wainwright was a Player of the Game (8IP 7K in the 3-2 win vs. the Padres) and earned 1.0 Box-Toppers point, giving him 12.7 for the season. He is in seventh place among players (see the updated top 10 list). Mariners pitcher Felix Hernandez was a Player of the Game (6IP 0R 7K in the 12-5 win vs. the Astros) and earned 1.0 Box-Toppers point, giving him 11.4 for the season. He is in ninth place among players (see the updated top 10 list). Paul Goldschmidt of the Diamondbacks was a Player of the Game (1-1, 2B, 2BB in 3-1 win vs. the Giants) and earned 1.0 Box-Toppers point, giving him 10.7 for the season. He and Gonzalez are the 18th and 19th players to reach 10.0 Box-Toppers points for the season. Goldschmidt is in 15th place on the Box-Toppers player list. Harvey receives 2.0 Box-Toppers points for being Player of the Day. Masterson receives 1.7 for NL Player of the Day. Napoli and Gonzalez each receive 1.5 for being top Batter of the Day in their league.